This is what had happened last week in Mumbai, when a local eatery used unmanned drone to execute a delivery of pizza by taking the aerial route. 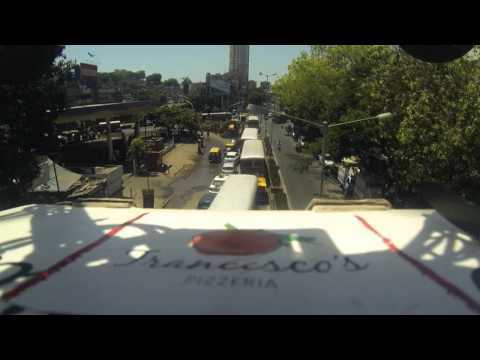 On May 11, the financial capital Mumbai, known for its traffic chaos, witnessed the country’s first test delivery of pizza with the help of a flying robot, to a customer 1.5 Km away. However, this is not the first time in the world that the idea of drone delivery has been experimented with. Last year, Amazon’s CEO Jeff Bezos made headlines worldwide, after he announced that his company would offer 30-minute deliveries with the help of drones. ‘Francesco’s Pizzeria’, a Mumbai-based pizza outlet has evidently been inspired by the Amazon CEO’s vision for the future. “All of us had read about global e-commerce giant Amazon’s plans of using drones. We successfully carried out a test-delivery by sending a pizza from our outlet in central Mumbai’s Lower Parel area and delivered it to a high-rise building at Worli”. Francesco’s Pizzeria chief executive Mikhel Rajani said, claiming that it is for the first time that a drone has been used for such a purpose in the country. He stressed that this was only a test-flight but its results confirmed that it can be used routinely in few years. Rajani pointed that the drone saves time and costs for a company like his, which would otherwise depend on a two-wheeler borne agent to deliver the pizzas. Every such customized drone costs around USD 2,000. Success of the drone pizza delivery by Francesco’s Pizzeria is highly commendable, where traffic congestion hinders timely delivery. However, this type of service would still take a few more years to become a reality, especially in India.